Situation: in the district Arolo, suburbian area, dead-end street, altitude 300 m.
Access/parking: gravel road, approx. 800 m, narrow. Estate (shared use): approx. 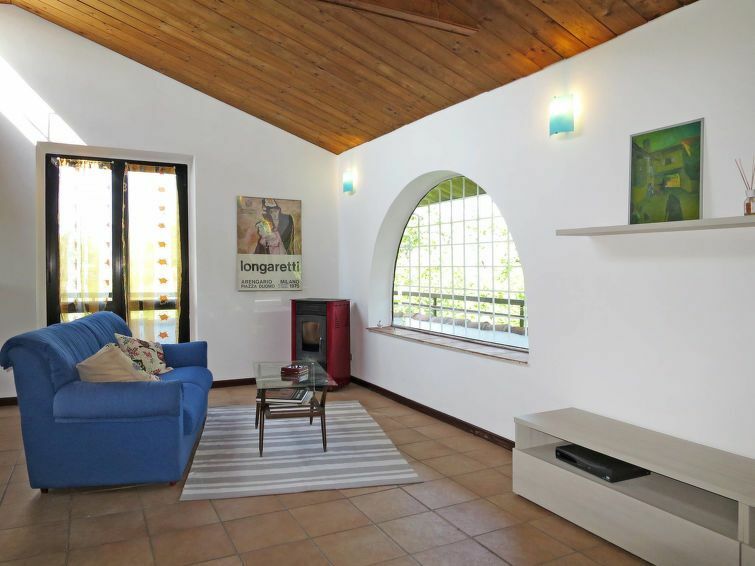 120 m², open plot, in a hillside, terraced, trees, meadow, forest, palm trees. Important information: The beach in approx. 130 m distance is a beach with rocks and stones. Access via a natural forest trail, partly steep. Plot description: 1 x parking near the house; parking on the estate. balcony, terrace 15 m² (roofed), (garden table, 6 chairs), brick barbecue. Center Leggiuno in approx. 2.3 km. Varese in approx. 17 km. Milano in approx. 75 km. Next shopping possibility (Leggiuno) in approx. 2.3 km. Next supermarket (Laveno) in approx. 9 km. Train station Sangiano in approx. 2.9 km (Linea Laveno-Gallarate-Milano). Airport Milano/Malpensa in approx. 33 km. Harbour/marina in approx. 1.4 km. Lake in approx. 130 m (Lago Maggiore). Rocky beach (via footpath) in approx. 130 m. Grassy beach in approx. 1.4 km (Arolo). Cable car Laveno: Sasso del Ferro, in approx. 9 km. Golf course Luvinate: Golf Club Varese (18-hole golf course) in approx. 13 km. detached house, 6 people, 4 room/s, 3 bedroom/s, 1 bathroom/s, approx. 85 m², 2 floor/s. Please note: Non-smoking house. Feature: Property on an estate (3 building(s) in total). Living room(floor 1): sofa, pellet stove (only heating possibility), exit to balcony. From the living room stairs to lower levels. Kitchen: open to the living room. Kitchen/ cooking equipment: 4 gas rings, oven, microwave oven, refrigerator, coffee machine. Bedroom 1(ground floor): double bed, exit to balcony.